We’ve just released version 0.10 of the High Frontier video game! This is a pretty big release, with a long list of improvements. …and yes, that’s a passenger ship you see about to dock in the image above. Fixed several small bugs with attachment points in design mode. Also in design mode, the selected part is now yellow rather than blue, to make it easier to see (especially with solar panels). Fixed a bug where the spin on one part would sometimes get reset to zero when adding another part. Added mouse-over help for the various items in the Parts palette. 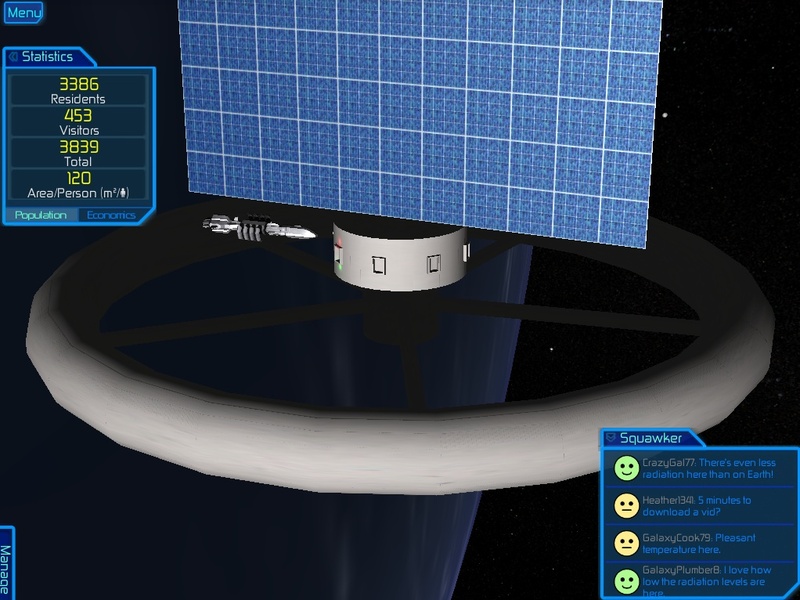 In Manage mode, we now show transport ships coming and going, provided you have docks for them to use. Added initial support for mods (plug-in modules that add functionality to the game). Watch this blog for more details about this in the next few days. Converted all files to a new format (called GRFON). This unfortunately means that old designs and colonies will not load in the new version. However, the new format is much more flexible and extensible, so we expect this will be the last time that ever happens! In Manage mode, replaced the Select Colony palette with a Manage palette. This has a files button that brings up our standard file dialog, providing a way to delete old colonies. It will also be where the rest of the management controls go, which will be important soon as we start adding internal colony management. We’re very excited to have all the colony design and external management stuff pretty well squared away and playable now. We’ll be turning our focus to the internal colony management: laying down paths and public transit, zoning for buildings, layout out parks and water features, and so on. So, please FOLLOW this blog (using the button at right) if you haven’t already, and keep an eye out for important updates in the coming weeks!